Are you like me? Are you filled with Christmas spirit all month long? Do you try to bring a Christmasy something into each day and/or meal for your family? Well, if you don’t I highly recommend it. If you do, you can probably vouch for how a little bit here or there, magically gets everyone in the Christmas mood. It’s like magic, and as a Mom, it’s a beautiful thing to behold. There’s no question we all love bread in th is family, and I try to have some sort of option (if it’s appropriate) with our dinners. Knowing I’m trying to slip a little holiday cheer into pretty much anything and everything right now, I figured why make dinner rolls or a plain loaf of bread, if I can put a pull-apart Christmas tree on the table? At the grocery store, I had seen a tree-shaped cake pan, and I thought it would be pretty cool for baking bread. Then I thought about it some more and figured that I could make a free-form tree shape instead. Making and then using cheese-filled dough balls, the sons and I created a Christmas tree shape with our loose interpretation of a star on top. We needed some green and used some dried parsley flakes for that, but if you’re feeling more traditional sprinkle some rosemary on top. Rosemary’s much more Christmas tree like in texture anyway. I figured at least a few of our seems would leak filling during baking, but wasn’t overly concerned. The sons decided that it worked perfectly because our tree had snow on it too! 1. Lay out, or roll out depending on if you’re using refrigerated pizza crust or actual dough, pizza dough onto a cutting board and stretch to a 10 x 15 inch size. Use a pizza cutter to cut the dough into 28 equal squares. In a bowl, combine cream cheese and shredded cheese, stirring until evenly combined. 2. Add roughly one tablespoon of the cheese to each dough square. Seal the seems and then gently roll the dough in your hand to form a ball. 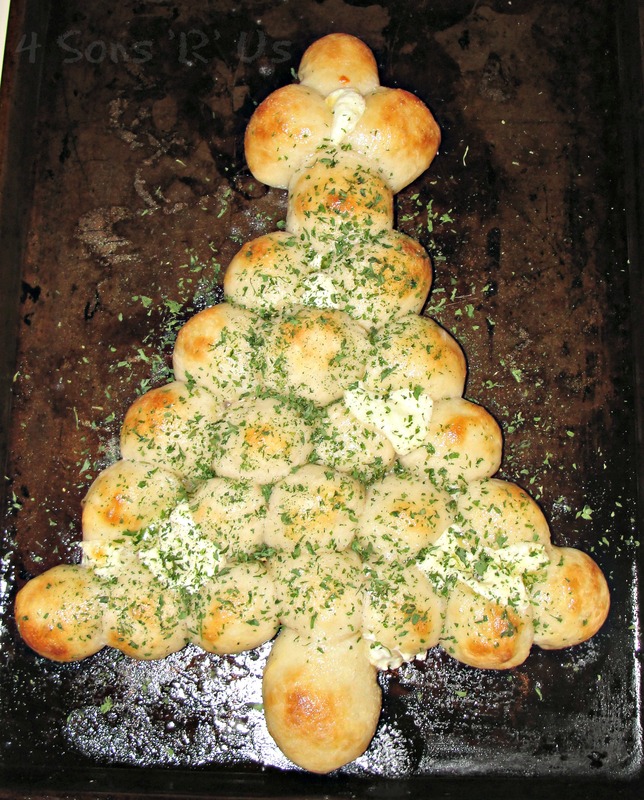 Place the dough balls on a cookie sheet in a Christmas tree shape as shown in the picture above. Bake at 400 degrees for 15 – 17 minutes, or until golden brown on top. 3. In a small pot, melt the butter and stir in the garlic powder. After removing the pull-apart bread from the oven, brush the top with butter and sprinkle with your herbs. 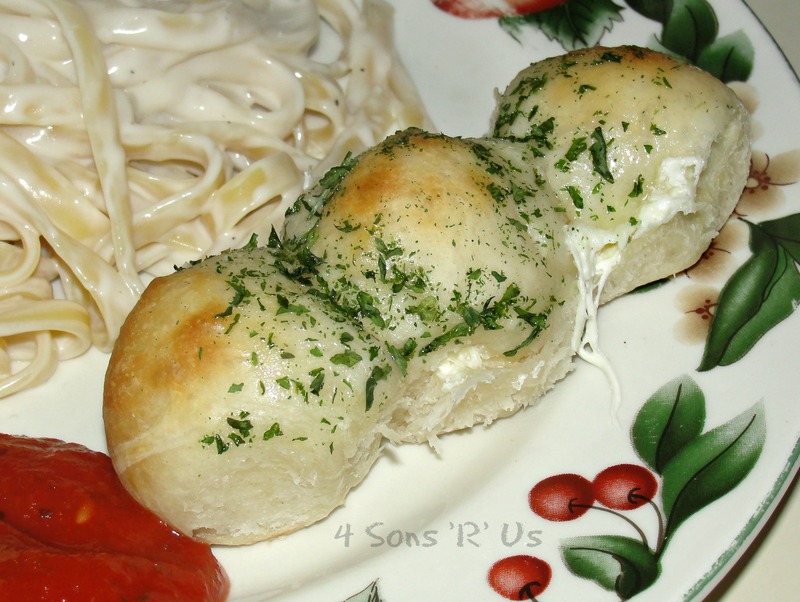 Serve pull apart with warm marinara sauce for dipping. Adorable! I can only imagine how much the boys loved this! That is absolutely brilliant! I feel Christmassy from October! Heyy love the idea here. Lovely and fun dish to eat with family. What a fun way to eat bread, Meaghan. This looks really adorable. Can I just stare at this beauty? Of course not. I am pulling one now. 😛 Happy FF. Your tree is adorable! Thanks so much for sharing with Full Plate Thursday and have a very special Christmas week! I like your christmas tree bread! Very cool!